Andrew Camardella lifted the Haymakers to a 3-2 victory over the Coyotes. Camardella singled in one run in the first inning, and then followed with a solo homerun that banged off the batting cages in center field. Josh Graves pitched three innings while striking two out. Tim Quinn hit a solo homerun over the left field wall in the fourth inning to draw the coyotes within one. The Coyotes could not muster up any more offense as Matt Parrish allowed one single, but no runs in the bottom of the fifth inning. Hank Burditt took the loss for the Coyotes as he pitched three innings and giving up three runs. 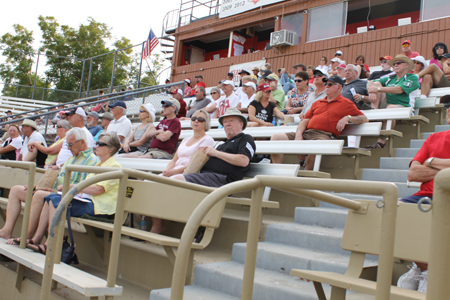 The Bay Area Bootleggers defeated the Palm Springs Power 2-1 in shortened five inning game. The game was close throughout as neither team’s offense could get much going. The Bootleggers were led by pitcher Colby Gurney, who threw five innings striking out six. Gurney gave up just one run to get the victory for the Bootleggers. The Palm Springs Power pitching was just as good as Power pitcher Heath Gray threw four innings giving up two unearned runs and striking out four. Gray would take the loss. In a matchup of two teams searching for their first win in the 2014 season, the Lumberjacks (1-2) handed the Bombers (0-4) their third consecutive walk off loss in as many days. William Smalls led the way for the Jacks in a 1-2 day that included two RBI’s. Jonathan Sigado of the Bombers matched Smalls’ tally with two RBIs of his own in the losing effort. The Bombers entered the final frame of the game up by two runs but Steve Rasmussen proceeded to walk the leadoff hitter Vincent DiFazzio. The bases would end up loaded with two outs, setting up the stage for Gordon Andy Weliver’s game winning base hit. Offense was the story in the final game on Sunday as the Washington Blue Sox (1-1-1) outlasted the Canada A’s (2-2) 10-6 to wrap up the weekend in the California Winter League. Sean McIntyre was able to bounce back after the first and work four innings, striking out five earning his first win of the season.